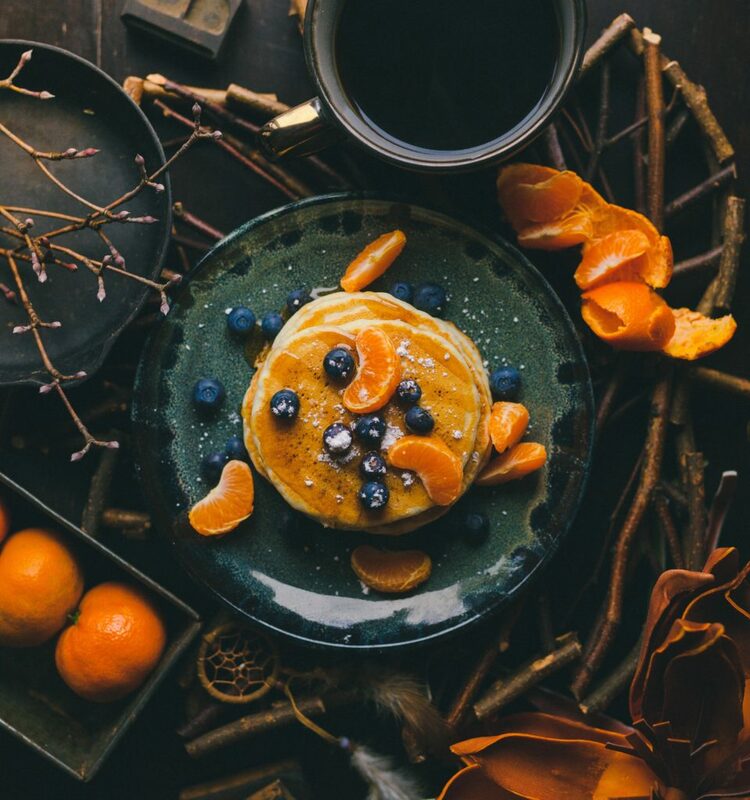 I give you two different recipes for pumpkin pancakes here to experiment with and a recipe for a warm pumpkin and maple syrup sauce that will make your pumpkin pancake breakfast really special and provide lots of beta-carotene. Have fun topping your pancakes with various fruits. Mandarin oranges and blueberries. Strawberries and bananas. Raspberries and blueberries. Hot Apple Compote. Diced peaches. I suggest you read my blog for tips on making perfect pancakes and apply those tips to making these recipes. In that blog I also link to an electric griddle that I recommend cooking all your pancakes on since you can control the temperature which is key to making perfect pancakes. With its bright orange color, the pumpkin is bursting with beta-carotene, vitamin C and also potassium. Current research shows that the anti-oxidant beta-carotene may reduce the risks of developing certain types of cancer and may offer protection against heart disease. Pumpkin seeds & pumpkin seed oil are good sources of zinc and unsaturated fatty acids. Botanically speaking, a pumpkin is a squash and is native to the Americas dating as far back as the Indians in the 1500’s. Pumpkins have become a symbol of American tradition at both Halloween & Thanksgiving thanks to the first colonial settlers. Pumpkins can be served as a boiled or baked vegetable and a filling for pies, custards or cornbread. Pumpkin seeds can be roasted for healthy snacking! Top your favorite pancakes with Pumpkin Maple Sauce. It is wonderful and has lots of beta-carotene. Heat 1 cup maple syrup, 1 1/4 cups LIBBY’S 100% Pure Pumpkin and 1/4 teaspoon ground cinnamon or pumpkin pie spice in small saucepan until warm. The perfect breakfast for a cool Fall Sunday morning. These are so delicious that I have personally eaten 4 pounds of these in one week! A little sweet, a little spicy, these are addictive! Add a little squirt of Sriracha to the sauce to add more heat if you’d like. Heat the oven to 400 F. Line a baking sheet with foil. As you stem and halve the Brussels sprouts, toss them into a medium sized bowl. Add the oil and toss the Brussels sprouts to coat evenly. Pour them onto a baking sheet lined with foil. In the same bowl, whisk together the garlic, fish or soy sauce and the sweet chili sauce and set aside. When the oven is hot, put the baking sheet into the oven and roast in the oven for 15 minutes, tossing them halfway so they cook evenly. Remove Brussels sprouts from the oven and turn oven broiler onto high, with the oven rack positioned in the top third of the oven. Place the Brussels sprouts into the bowl with the sauce and toss to coat evenly. 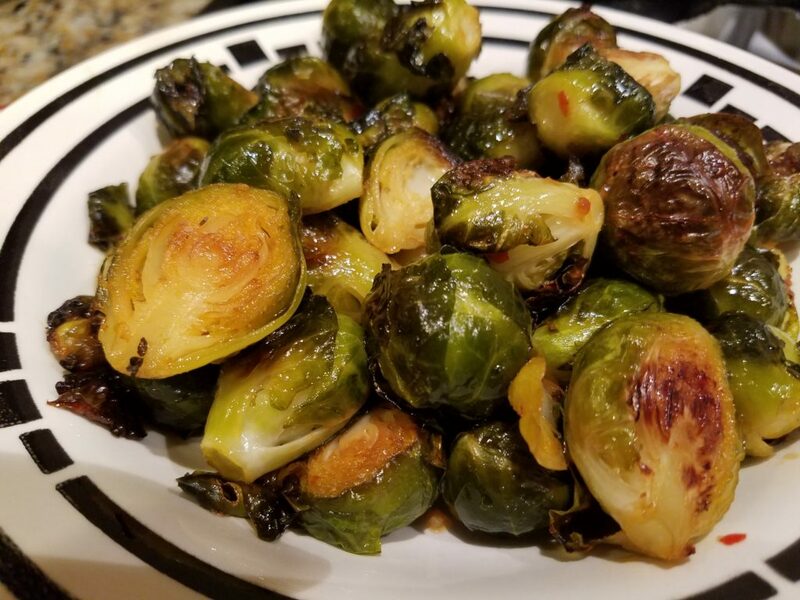 Put them back onto the baking sheet and broil the Brussels sprouts for 5 minutes or until the chili sauce is bubbling and caramelizing. Watch them carefully so they don’t burn! Remove from the oven and serve immediately.